Knowledge and practical skills will be gained by a mixture of pre-course on-line lectures, demos, skills stations, and iMac workstations for pathology recognition. 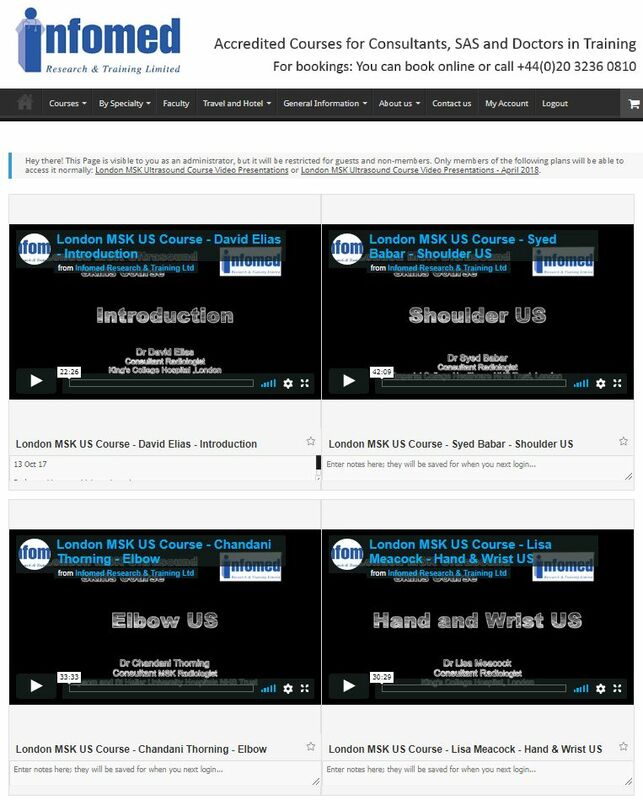 Pre-course online access to lectures (video and slides), covering anatomy and pathologies on shoulder, elbow, wrist and hand, hip, knee, and ankle and foot. Cases, including pathology recognition at iMac workstations. This course provides 12 CPD credits in accordance with the CPD Scheme of the Royal College of Radiologists, plus up to 3 CPD credits online learning. Introduction to MSK US: Dr David Elias (22 mins). Shoulder Ultrasound: Dr Syed Babar (42 mins). Elbow US: Dr Chandani Thorning (33 minutes). Hand & Wrist US: Dr Lisa Meacock (30 mins). Ultrasound and Synovitis: Dr David Elias (23 mins). Hip Ultrasound: Dr Leonard King (28 mins). Knee Ultrasound: Dr Leonard King (23 mins). Foot and Ankle Ultrasound: Dr Keshthra Satchi (18 mins). After viewing, the participant can save and/or print an Online Learning Certificate (3 hours).